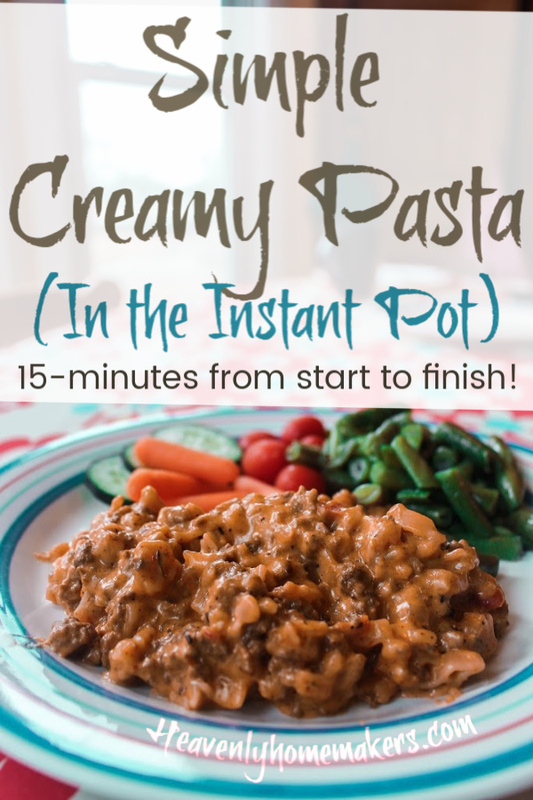 Introducing what has become my very favorite pasta meal to prepare: Simple Creamy Pasta in the Instant Pot! This is one of those recipes you’ll want to keep in your hip pocket for days you have no time to cook. Because guess what? Making this takes less time than it takes to run through a drive through to pick up take-out! As you know, I love having hamburger meat cooked ahead of time to pull out and use as needed for super quick meals. You can read here about how I cook 5-7 pounds of frozen hamburger meat in 30-minutes in my Instant Pot. It’s a HUGE time saver! This pasta recipe only takes 10-15 minutes from start to finish! If I don’t have meat already cooked, I quickly brown it in my Instant Pot before adding the other ingredients and I’ve only added a few minutes of prep to this dish. Either way, you can see that this meal is incredibly fast to put together. And everyone in my family loves it. You can’t go wrong with cheesy, creamy pasta!! Don’t have an Instant Pot? I have this one and I absolutely love how much time it saves in the kitchen. So do consider investing! But if you prefer, you can mix the ingredients together in your crock pot and cook it on low for 4 hours. 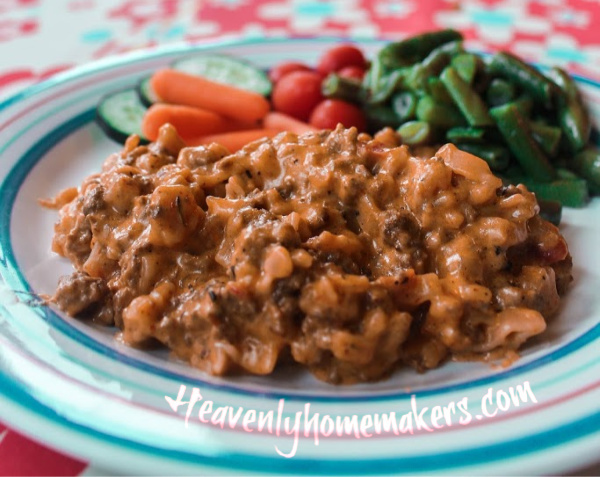 Then stir in the cheese and cream, and you’ve got an equally easy meal that cooked in your crock pot with no effort on your part! Stir cooked meat and dry pasta into the instant pot. Pour on spaghetti sauce and water, stirring until barely combined. Seal instant pot and cook on "hi" pressure, manual for 5 minutes. Do a quick release of pressure to open the lid. Stir in parmesan cheese and cream. We’ve got a huge list, and it keeps growing! 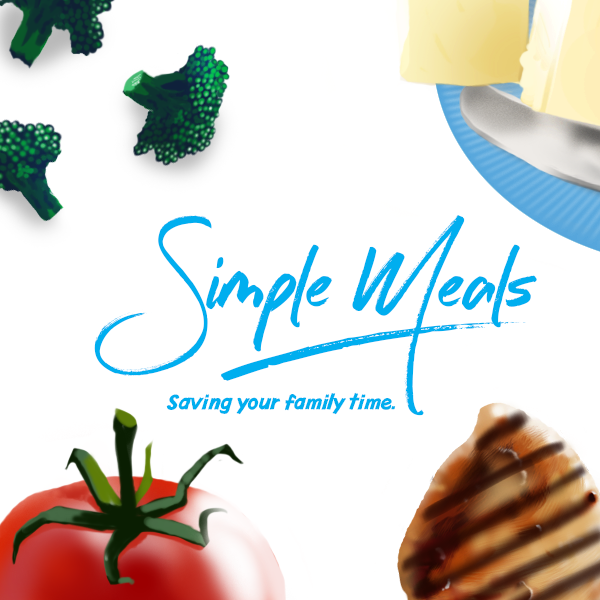 We love how Simple Meals has been saving family time for so many, and helping people put great food on the table each night! Join us for just $1/week! I am really looking forward to trying this! I made your instant pot mac and cheese and it’s the only homemade mac and cheese my kids like! And I love it because it really is so very, very fast and easy! Thank you so much for sharing Laura!! My kids loved this! I used whole milk and shredded Mexican cheese since that’s what I had. Loved it!!! This is basically the same idea as my favorite, super easy one pot spaghetti, but I don’t always have cream on hand and almost always have cream cheese. I put about half a brick of cream cheese in the instant pot with the other ingredients before cooking. Looks a little funny when you first open it up but it stirs in nicely. So easy and yummy!